I was browsing my Twitter list the other day and stumbled upon the link to the WordPress site of one of our volunteers – Travis Hitchcock. Travis has been in The Company Lab space on many occasions and he was a great volunteer during 48Hour Launch. Being the curious sort that I am, I was interested in what he might be blogging about. So, I jumped over to his site and found… a pleasant surprise. 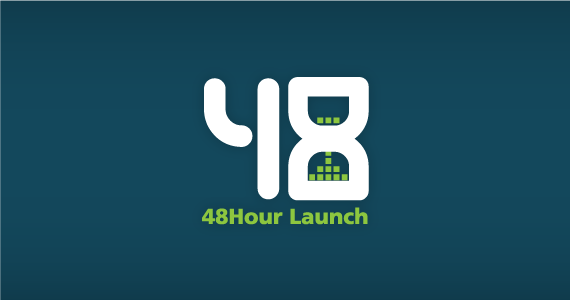 A few weekends ago, I stayed very busy working as a volunteer for The Company Lab during 48 Hour Launch, an awesome event that assists local Chattanooga entrepreneurs turn their innovative ideas for start-up businesses into reality in a short span of 48 hours. I had a great time just being a part of this incredible event, and seeing these innovators invest their time and energy into their passions. After the event wrapped up, and I returned back to reality, I was confronted with all the schoolwork that I had been putting off while I was participating in the launch. The first thing I did was read the final chapter of This Means This, This Means That: A User Guide To Semiotics (I’m pretty sad that it’s actually over). While reading this chapter (about stories, and storytelling), I was still in 48 Hour Launch mode, so all I could think of is how it related to what I saw at the event. The final night of the event was the demo night, where over twenty individuals pitched their final presentations of their new businesses. After they pitched, the audience would text in their vote for whichever idea they liked best, and the winners were awarded money and services to help their business get rolling even more. Almost every one of the pitches started with some type of story. They would normally start off by giving a narrative of the current situation, to show the problem that is in need of a change. For example, The UNfoundation started with a narrative about how hard it is for normal people with good ideas to get grants. Then many presentations would have a turning point in their lives, where they would begin to describe the specific moment when they realized they needed to make the change. For example, Natural Beautiful Me described how the idea came about while she was on a paintball trip with her co-workers. At the end of each story they presented the resolution (their business/product). In the case of the UNfoundation, he described how his business would award companies, groups, or even individuals with micro-grants each month, with a larger grant at the end of each year. After the presentations, we were left with a mystery, because no is sure how the businesses will do in the future, or who the winners would be. There has to be a reason why so many of the people at the event chose to use stories in their pitches. The main reasons, according to the book, is because these stories help to transmit ideas in a memorable form, and also give us a better way of understanding their needs, beliefs, desires, motivations, and actions. From what I noticed when watching the pitches, the companies who utilized these stories the most effectively, tended to have the most votes at the end. This is a great testament to the power and effectiveness good storytelling can have. Photograph. Timesfreepress.com. Chattanooga Publishing Company, Inc, 13 Nov. 2011. Web. 14 Nov. 2011. <http://timesfreepress.com/news/2011/nov/13/dozens-business-ideas-launched-48-hours/>. Photograph. Delegator. Delegator, Inc., 11 Apr. 2011. Web. 14 Nov. 2011. <http://www.delegator.com/48-hour-launch>.